Flavor Text: Rules are not made to be broken. Twisted, bent, or distorted, but not broken. can be very very good but not sure if makes it into a deck. Danigral - 4 out of 5. This just gives you back your largest domain. Very good. This can help put an additional big dude out, or set you up to surprise your opponent when he thinks you’re tapped out. It’s a tactic too, so using it with Naomi can be stellar if you’ve built your domains right. This is probably a 2-of in and dual-faction deck since it’s not necessarily helpful turn 1 except in a mono-Agency deck, but it will be especially helpful in a deck running Negotium to get more 3 cost characters out. mnBroncos - 2 out of 5. The effect is fine, however, I just don’t see many decks having room for this effect in their deck. Obtuse - 1 out of 5. Not horrible...but not really good either. There is always a better card to run instead of this. livingend - 1 out 5. You need a, parenthesis for emphasis, ton of card draw to make this worth the deck slot and that’s difficult to accomplish when you’re heavy on a faction that doesn’t excel in that regard. And heavy on Agency you will be, if you are to play this card between 2 points of steadfast and the additional play restriction. Temporary acceleration is rarely worth a card, as transient resources and other mediocre events like Initiation demonstrate. When you topdeck this in the late game and you’re starved for meaningful effects, just imagine me saying “I told you so” in a smug voice. Verdict: Assuming they change “Tactics.” to “Tactic.” in the next FAQ, maybe there’ll be an Agency Syndicate deck that makes use of it with Naomi. No, wait, I changed my mind. Even in that deck I’d rather have more copies of On The Lam. WWDrakey & Ire - 5 out of 5. Now, this is one of those cards people will go “doesn’t fit into my current Agency decks as they don’t draw that much, so why should I run it?” and proceed to give it a 1. Or maybe a 2. The problem there is, that the point is not in fitting existing decks, but rather in powering new ones, with different kinds of cost curves and card gain balances. The raw fact is, that these kinds of effects have always before been very much limited (compare with Crystal of the Elder Things and Itinerant Scholar) and yet… those have both seen play during the history of the game. Doing something to tempo that no other card really allows, for free… should scare people, more than it seems to. What am I missing that this card requires Agency x2 Steadfast? Doesn't the play restriction in the effect make the Steadfast redundant? Is there a universe where you could have two blue resources on a single domain but not have two blue resources across all your domains? 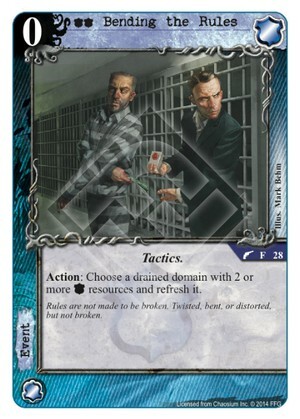 Also, I love how some of the reviews for this card give 5 stars and some give 1. Talk about love it or hate it. I'd totally build a deck around this card. Probably Agency/Miskatonic to get the card draws that would offset the extra plays. Then, look out! Edited to add: Maybe Agency/Syndicate to get Naomi with a City Map and abuse Tactics. Good ideas, Carthoris. I'm currently using it with the Blackwood Initiative to make my resources go further. It could be pretty sweet if you combined it with Syndicate, as you suggested. Can you imagine an opponent's frustration as you hit him with the Initiative AND Reallocate, while you used Bending the Rules for yourself? Mean. I think it's a really nice card, even if it's a little inefficient. Can you play events that have no legal target? Like use a shotgun blast if there are no characters in play? If so the steadfast is relevant, because it stops it from being a free event in some sort of theoretical future combo that just wants to play events. Sorry, anytime you are told to "choose" something, you have to be able to in order to use the effect.